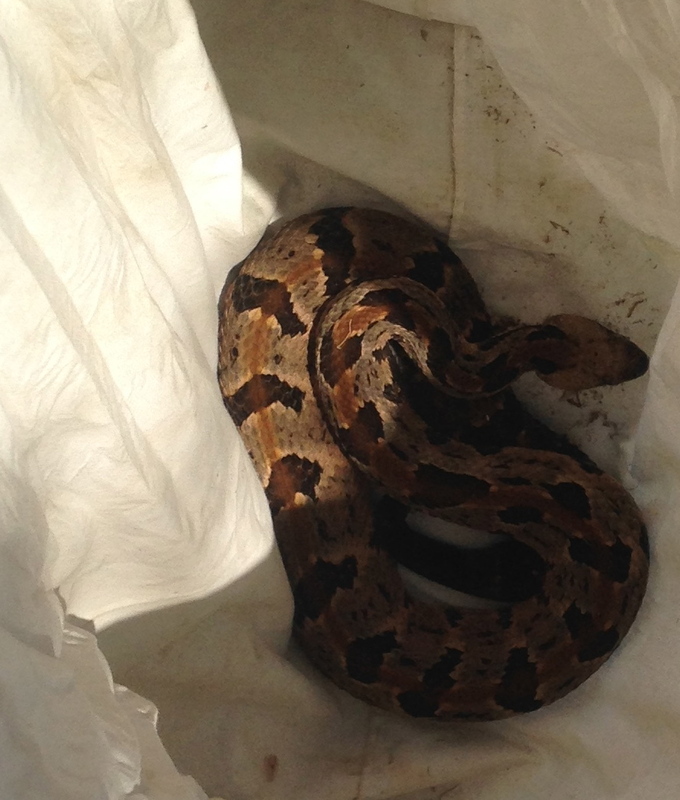 Mr. Rattlesnake just hanging in his pillow case (outside of course) before moving to his new home. It was a weekend of unlikely pairs. First, there was the matter of returning the pair of rattlesnakes our friend Hank caught right against our house a few days ago. The Mr. and Mrs. had just a little too close for comfort, pretty much on the other side of the wall of our bedroom, and although they were docile, because we wanted to welcome another pair–a pair of kayaks–to that area and didn’t want to accidentally step on rattlesnakes when loading or unloading, something had to give. After Hank drove around with them (contained of course) and housed them (he said Mrs. Rattlesnake rattled whenever he played the piano, but please know she was in a plastic tub with lid the whole time), he and Ken decided to put them back in our area, but far farther from the house. pillow case. Ken, Daniel and Hank went on a great walk to find the perfect place near a rocky outcrop with the kind of habitat the rattlers prefer, and let them loose. They said Mr., a rather laid-back character, went straight into a hole in the ground. Mrs. coiled up and rattled at them until they were out of earshot. The snakes out of the picture, we turned our attention to picking up the kayaks we were buying from friends Frank and Sandy, an endeavor that turns out to be almost as complicated as relocating rattlesnakes although not nearly as dangerous. After finding out weeks ago the cost of a car carrier, we set out to make our own, or rather Ken did while I drank tea on the porch. It took, as all home projects take, more trips to the hardware store than anticipated and a whole lot of “hold this while I hammer the nail” moments. 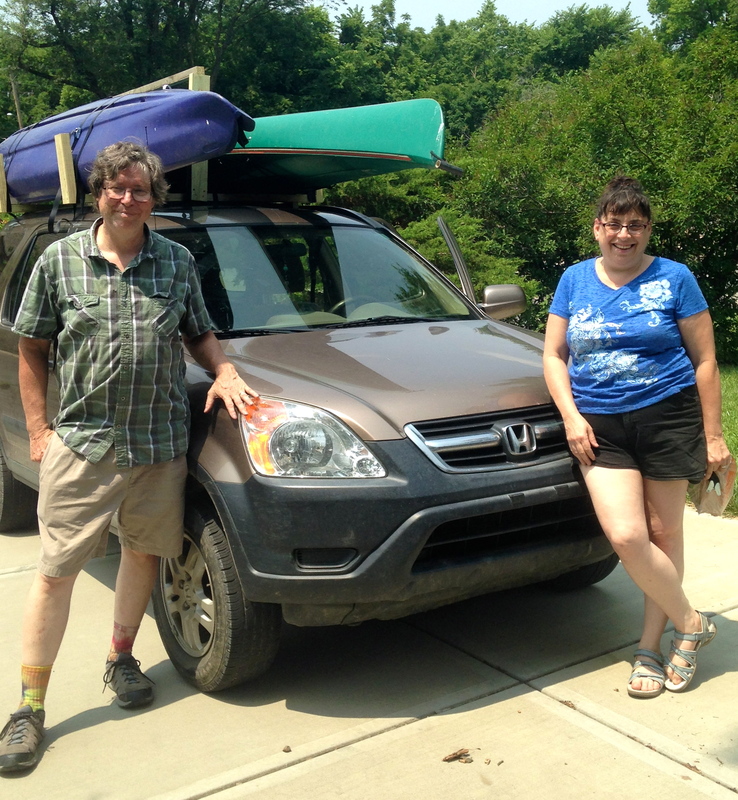 Finally, tied into place on the CRV, we trekked to our friends’ house, and loaded up the kayaks. Let’s just say the tying of the kayaks into place would have earned most eagle scouts advanced badges. 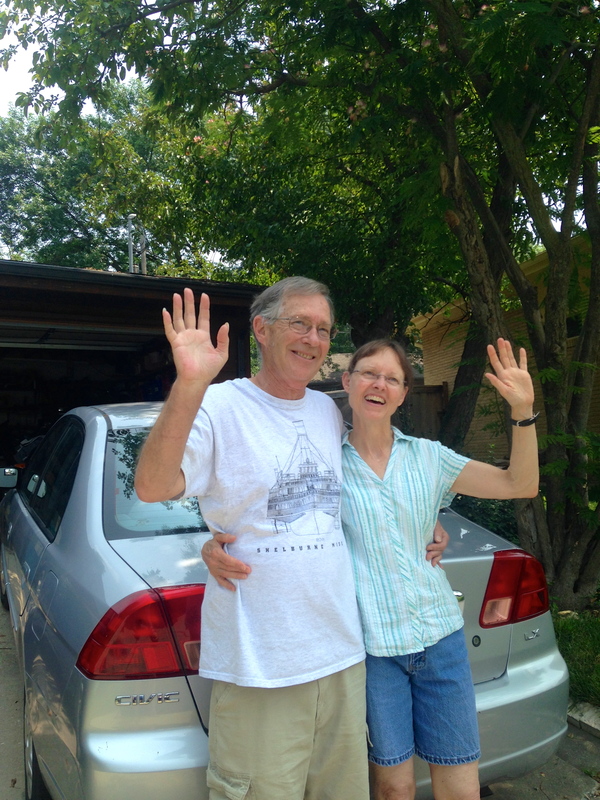 Frank and Sandy said goodbye to their old kayak friends, and we said hello. 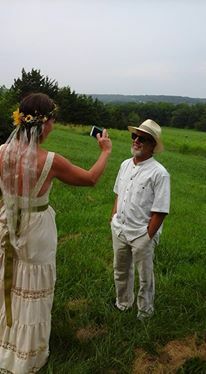 At the foot of Wells Overlook tower, we gathered in a crescent, starting with a smudging ceremony once Ken managed to light the sage they brought from their California home and the cedar for their Kansas roots. Their vows shined like a full moon on a summer’s night, full of beauty, steady light, and overwhelming awe in ordinary weather. The wind blew surprise gusts, tossing the little table we set up for wedding ingredients. The shade and sun mingled also, and when it was over, everyone hugged everyone, especially the new pair. 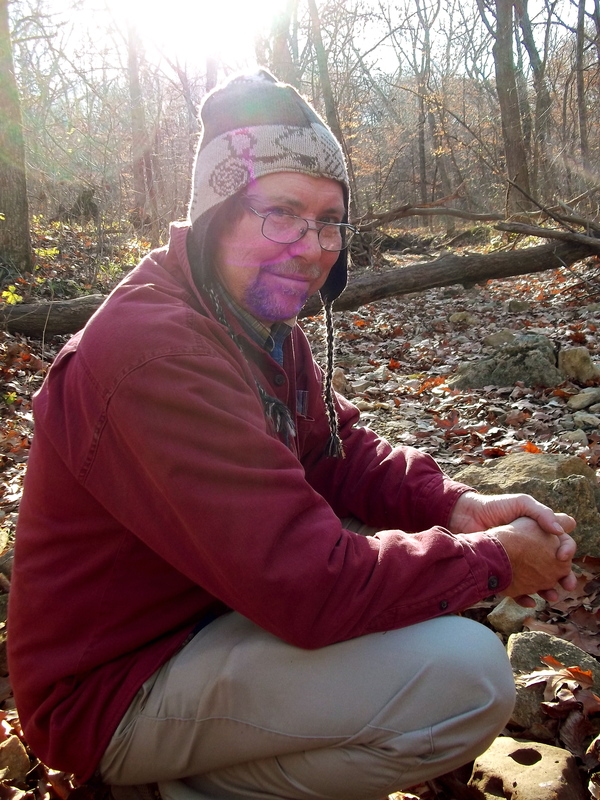 Now I will rest my pair of feet, drink a pair of glasses of water, and feed the pair of insistent cats, and later perhaps dream of kayaks, rattlesnakes, and a pair of beloveds happy in their new homes. The grooms walked Michael’s mom down the aisle between them. When they arrived at the front of the church, led by a wide line of children, friends and family ringing small bells, they each turned to hug Michael’s mom with all their heart. 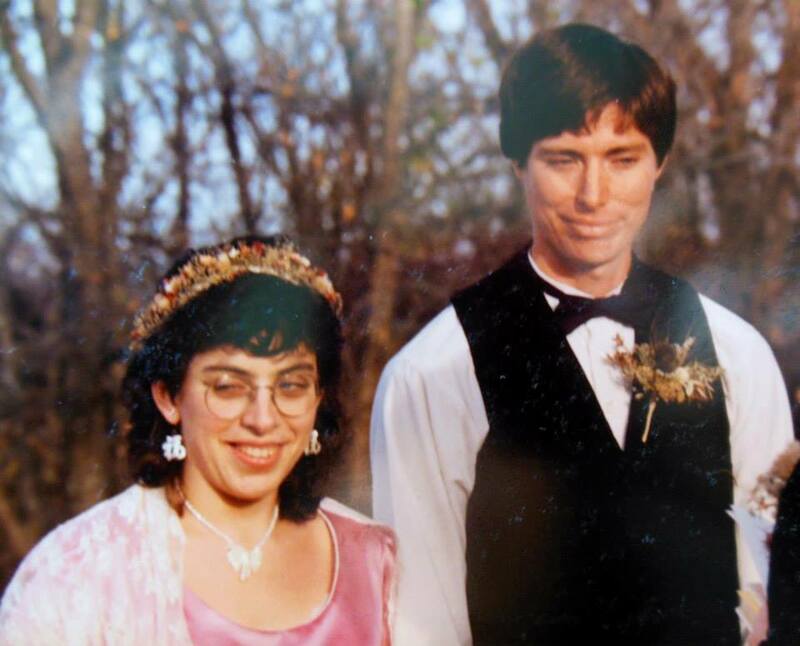 Thus began one of the most joyful and meaningful weddings in my life and surely in the life of Kansas. 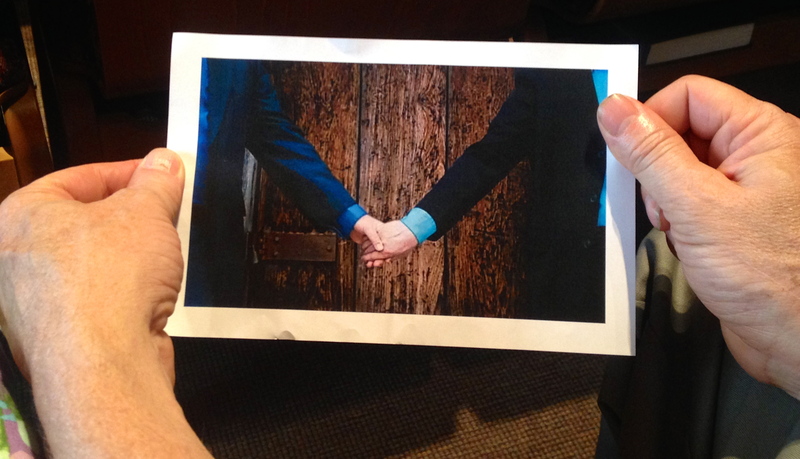 Michael and Charles were joined together in holy marriage on May 3 at the Unitarian Universalist Church in Manhattan, authorized by all of us there, the authority of their love and 30+ years together, and surely by the blossoming trees and sweet wind of this spring day. While the state of Kansas wasn’t in on the authorization of this marriage YET (and that’s a big YET), the rest of the known and unknown universe sure seemed in complete alignment. The guys were legally married some months earlier in California, but now in Kansas — where Michael is a minister, Charles a retired attorney, and both writers andrabble-rousers — this wedding lands on home ground. The ceremony itself was stunning. One groom could hardly stop crying, the other kept making us laugh so hard that we would cry ourselves into tears, and the music, readings, silence and vows were as beautiful as sunlight. 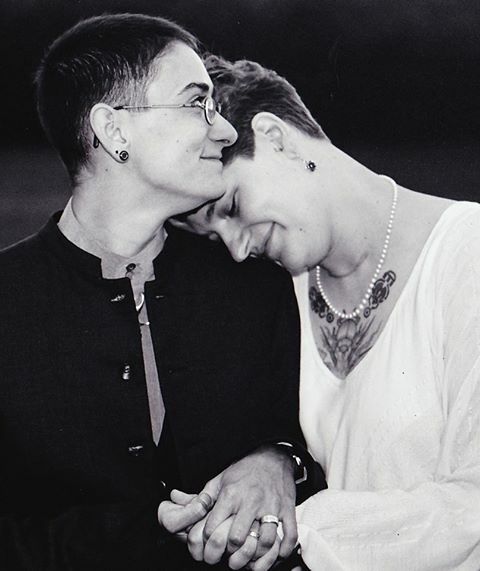 Throughout the ceremony, in what was said and what didn’t need to be said, it was clear that we had all arrived at a new time: one in which gay and lesbian marriage had arrived, even in a state that had already gone to great lengths to slam the door against it. Many of my friends and I joke as to whether Kansas will be the 48th or 49th state to recognize gay marriage (I tend to think we’ll do it before Mississippi and Alabama, but who knows? ), but thanks to my dear friends Charles and Michael, recognition may come sooner rather than later. 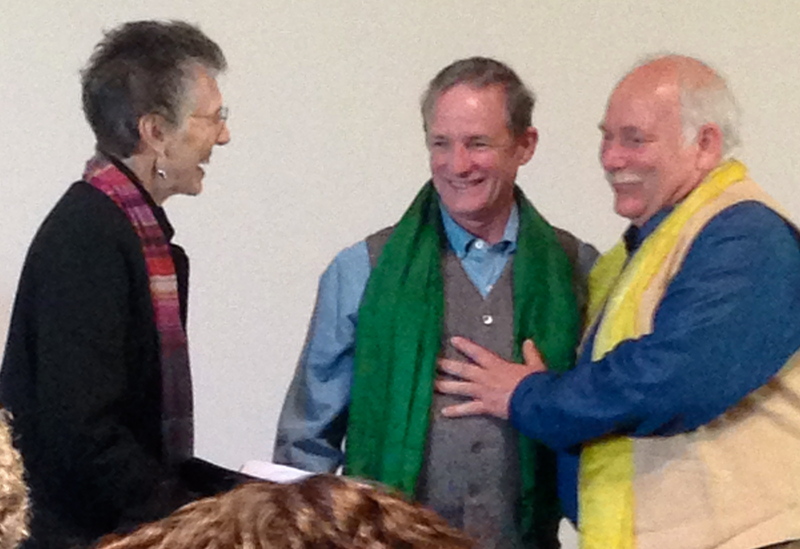 These good men are one of two couples suing the state of Kansas to file taxes as married, and in lieu of wedding gifts, Michael and Charles asked for contributions to All’s Fair Kansas, the organization fighting for marriage equality here in the land lately known as Brownbackistan. Having known Michael and Charles for over 20 years, I have no doubt that all of us in Kansas or who have Kansas states of mind are very fortunate to have such committed, loving, wise and kind men putting themselves out there on our behalf. While it might be presumptuous for a straight woman like myself to say this, I believe so much that marriage equality lifts all of us up. It breaks the cycle of silencing and choking shame that forces some to swallow their pride, identity and truth, which cannot help but diminish the health and strength of individuals, communities, cultures, even a whole state. Freedom is truly only complete when it isn’t tarnished by giving privilege to some at the expense of others. Love too is more complete out in the open. As I watched Michael and Charles marry, like most everyone else crying, laughing and cheering in that church, I felt such awe and love for these men: for their courage, their beauty, their truth. For their love of flowers and adventure and each other. 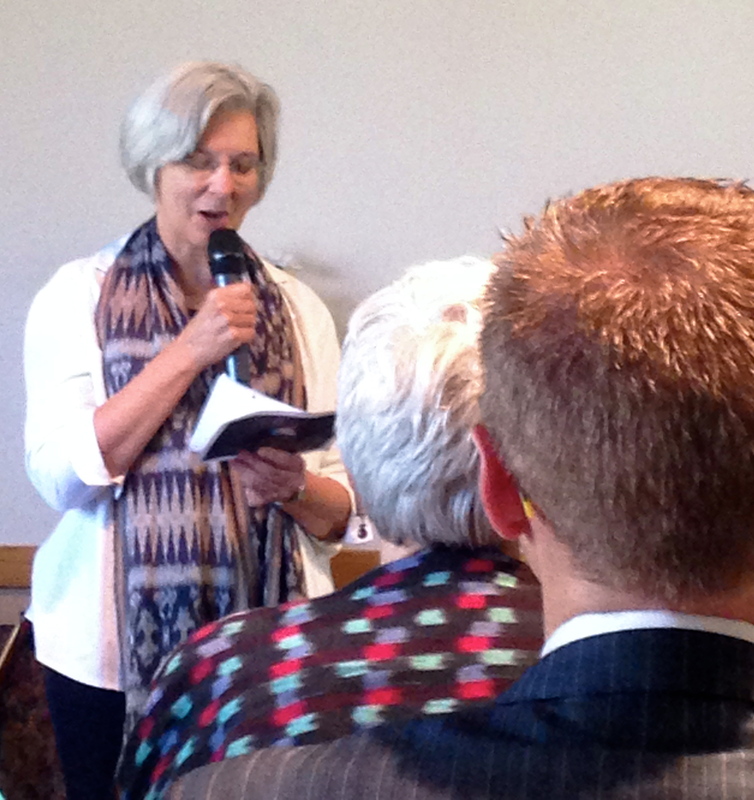 For their vision of community here in the heartland. For their art and heart, and willingness to very soon after the ceremony, sing together with many of us on the dance floor, “Going to the chapel, and I’m going to get married.” And for doing just that on this day. 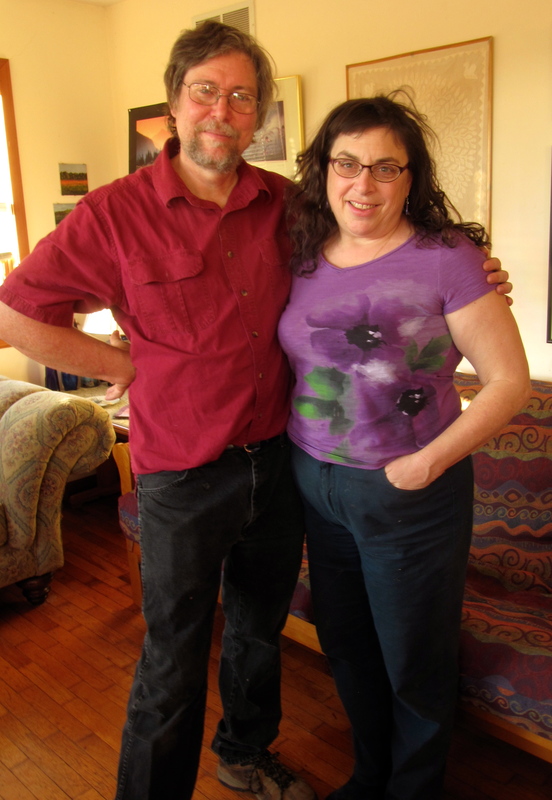 Over 31 years ago, I fell in love with a decidedly, according to popular media at least, unromantic man. No rose petals leading a path to a candle-lit dinner. No charismatic charms displayed through gifts perfectly chosen, and sometimes on birthdays, holidays, even Valentine’s days, no gifts at all. As soon as he returns from a nine-hour day of work, plus commuting 45 minutes each way after waking up at 5:30 a.m. he puts on his coveralls and rushes outside in the snow to shovel a path to the cars, including clearing my car, so no one in our family slips. Sleeping on lumpy hospital cots beside me after surgeries, bringing me large cups of hold water to sip during hours of chemotherapy in between reading aloud to me bizarre bits of the paper, and taking off for the one pharmacy open at 2 a.m. once to get me drugs to ease my pain. Changing thousands of diapers without prompting. Hauling babies and all their bags of diapers, juice, toys, bibs, extra clothes and more. Rocking those babies in the middle of the night after I woke him up, even if I had to kick him a little because he sleeps through anything. Waking up early to make those creepy-crawling kids of ours pancakes while he downs an extra cup of coffee and lets me sleep in. Never once even hinting that I need to not be a writer despite the hours it sometimes took away from him having some free time for himself between work, children, the farm, and helping his family. Accepting my far louder family with curiosity and appreciation even if we broke out into show tunes at the drop of a hat and considered a great family gathering to include six kinds of dessert and karaoke. Holding my father’s arm in the last moments of his life while telling my dad how good it was to see him (after flying out with me on little notice, then driving hours in the snow on little sleep). Saying “Oh, no!” when I tell him I think I’m getting a cold, and then expressing genuine empathy. Doing the laundry. All the laundry for the most part. Including the laundry for three kids, one of whom changed her outfit every two hours. For over 30 years. Laughing so hard at the parts we love in our favorite movies, reminding me of the first time I heard him laugh in abandon when we went to a park late at night and swung on the swings very high. Processing thousands of nuances of interpersonal mishaps w ith me to help me find the way forward with love and respect for all. Cleaning the dog vomit on the floor, and much of the kid stomach flu evidence over the years because I can’t do it without throwing up. Lying awake late at night with me, scheming about events we’d organize, projects we’d launch, and communities we’d support, and then, in the daytime, working with me to make it all happen. While not caring if his shirt is fraying at the edges, letting me parade before him in multiple outfits so he can advise me on what best fits the occasion and makes me look best. Simply not caring if I gained or lost 20 pounds. Not objecting when I scooted my freezing toes under his warm feet in bed on a winter’s night. Occasionally writing me a love letter so beautiful that I no longer care that he forgot a birthday, and in recent years, actually remembering birthdays, holidays and Valentine’s day, not because they matter to him but because it matters to me. Happy Valentine’s Day to all of us no matter who we love and how we love, and may we find the romance in folded laundry, a hot bowl of soup, and someone who truly gets who we are. “Like it matters,” added Courtney. 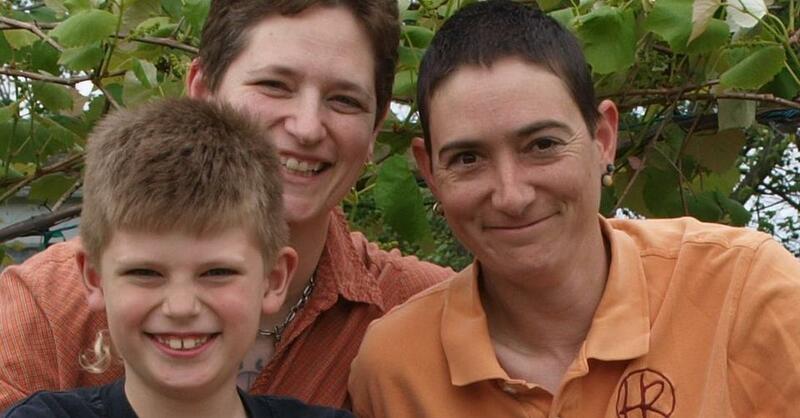 At the time, early 2001, gay marriage was so small a glimmer of possibility, something we all thought might happen in our lifetime, maybe when we were passing around pictures of our grandchildren. Making due without being able to make up for this injustice was all we had. 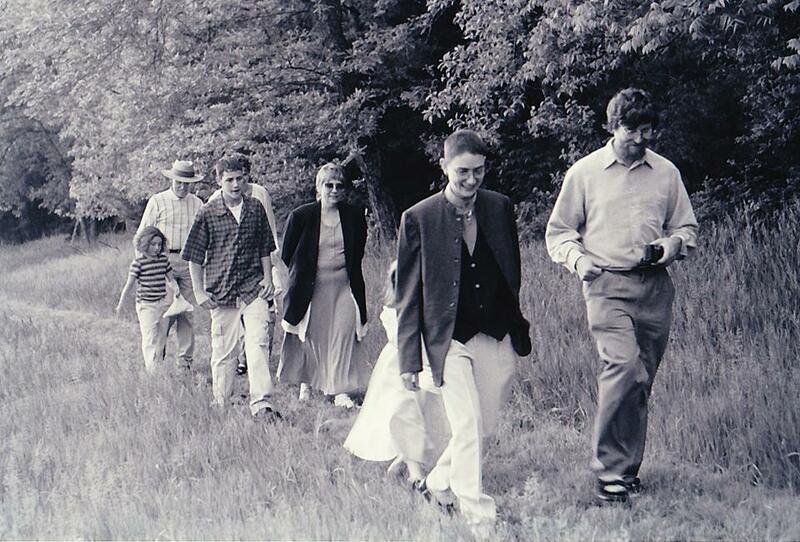 So on May 5, 2001, we gathered at Ken and my house south of Lawrence, and gleefully paraded with family and friends alongside the woods to the southeast corner of a field. Denise was crying and swirling in her wide-swinging white dress while Courtney was laughing and rolling her eyes. They held hands, looked at each other, Denise giggling and crying at once, as they came to the exact place where I would marry them. We got to know Denise in her job at Free State Credit Union and through the Merc, and Courtney when she was a para for our oldest son in 5th grade. Over the 1990s, we become close friends, the kind who can take naps on one another’s couches or leave a dinner conversation to do something on the computer for work, no explanation needed. It was as if we had been family for decades before we actually met, and we hang out together, in I Love Lucy terms, not like Ricky, Lucy, Fred and Ethel, but more like Ricky and three Lucys. So of course I could be a pretend rabbi, acting in faith that this was a real marriage, and one day the world would catch up Courtney and Denise. They had been together for years, and all of us had just been through Denise’s thyroid cancer together when Courtney had to endure the insult of fighting to see her beloved in the hospital because they were both women. The wedding happened at dusk in a slim gap of sunlight on an afternoon of rain. The whole wedding party stood in a circle around the bride and bride, my daughter Natalie excited to be ring bearer in her white pants and rainbow shirt, my sons and husband wrapped close, smiling and crying with joy like all the other guests there. In the 13 years since the not-real real wedding, Courtney and Denise had a son, Marek, born during a very joyous if not long labor at the Topeka Birthing Center. Denise decided to become a nurse, and after two years of prerequisite classes, got accepted into the prestigious nursing program at Baker University, graduated with flying colors, and now works at Stormont-Vail Medical Center. Courtney was finally able to leave her job at the post office to throw her immense energy into Courtney and Denise’s family family, Homestead Ranch, where they raise goats, chickens and other critters, grow immense amounts of vegetables, and hand craft the best goat milk soaps and lotions on the planet. 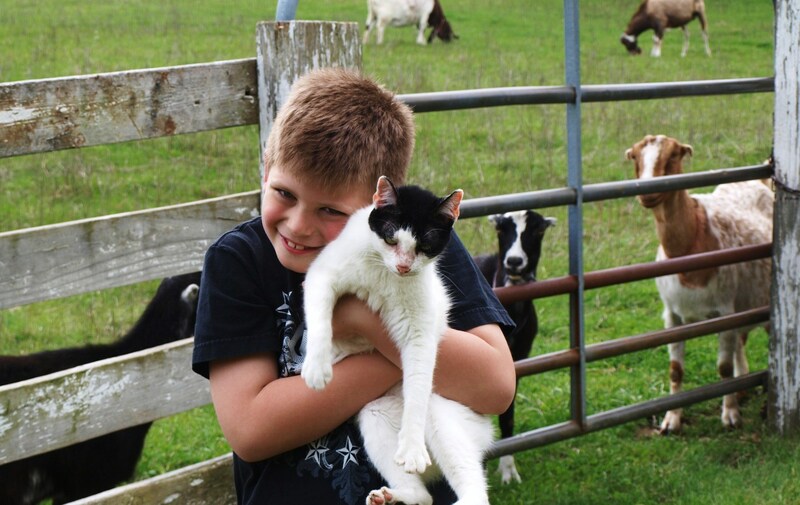 Marek is close to 10 years old, and excels at Karate, making holiday ornaments to sell at the farmer’s market, and he plays a mean game of Apples to Apples. The whole family has run a booth at the farmer’s market, waking in the dark and wee hours every Saturday from May through November, for years, and cater to a loyal following. A family business and farm. A child and his education. A home full of dogs, cats and tree frogs. A rich life with plenty of bouts of Guitar Hero and other games to play together. Spectacular turkey dinners with all the trimmings on Thanksgiving and beyond. And now land where they plan to build their dream house in coming years. Married in Iowa, So Why Not Kansas Too? Throughout the years, we’ve come to know each other’s extended families, shared the sorrow of a close friend’s sudden passing, the loss of fathers and mothers, birthday parties and bar mitzvahs, and an outrageous amount of spaghetti and meatball dinners. 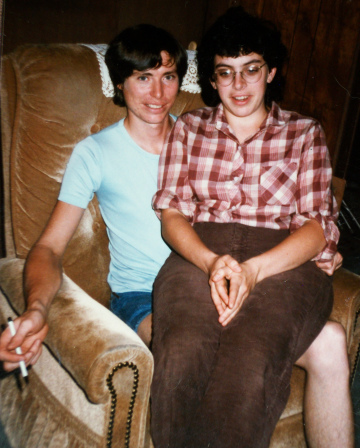 Those in our family who, at first, had complaints about a lesbian couple, like much of America, softened their position over the years, eventually dissolving away such complaints. 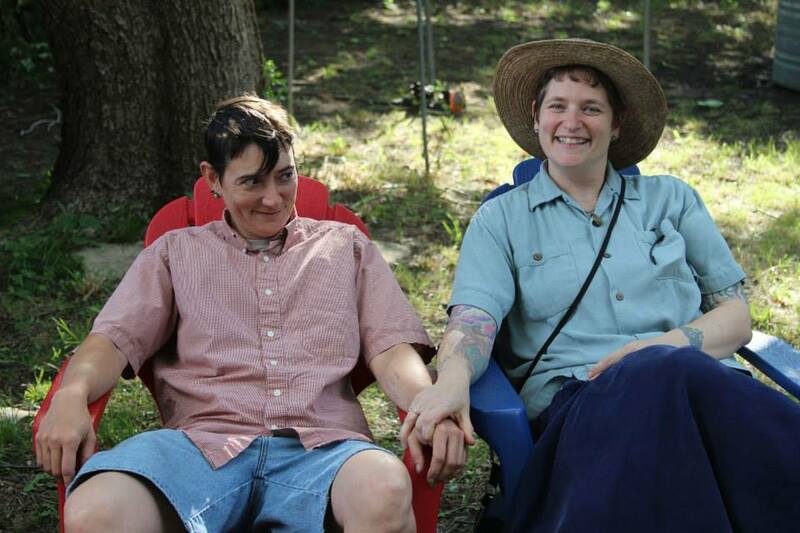 Courtney and Denise effectively, simply by being who they were and being around, changed the minds of people in our extended families as well as people they met through work, kids’ activities and the farmer’s market, about gay rights. 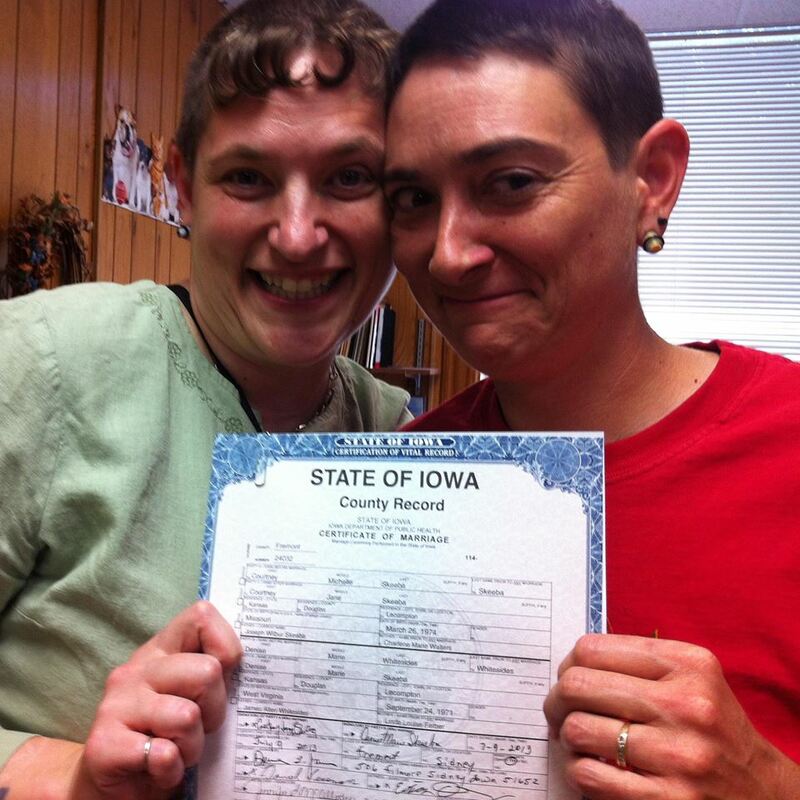 Yet it took until July of 2013 for Courtney and Denise to get legally married, and they had to travel out of state to Sidney, Iowa for the ceremony because our home state doesn’t recognize marriage between two women. 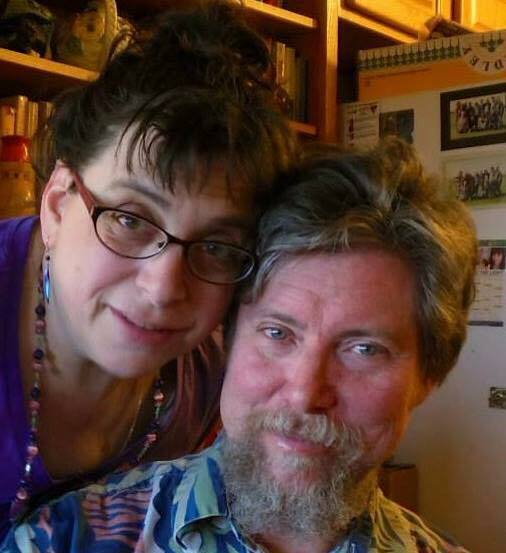 They also had to work long and hard to get Courtney covered on Denise’s health insurance, and they still can’t file taxes jointly. Our dear friends who live and love a lot like us, and yet have to wait in the background for the light of equality to slowly reach them and other-than-hetero-identified people. The advancement of gay marriage has moved a million times faster than I never dreamed when I was growing up, watching gay or lesbian friends or acquaintances cast, at best, as exotic, and at worst, as repugnant. Yet when it comes to my friends and so many other Kansans who have waited years, decades, lifetimes, to be able to simply say “my wife” or “my husband” and reap other legal, economic, religious and social benefits, the wait is excruciatingly slow. It didn’t matter in 2001 that I wasn’t legally sanctioned to marry anyone. It should have, and it sure matters even more today that Kansans who aren’t of the heterosexual variety must either have no n-legal weddings or leave the state. What does matter: Love. Justice. Community. Let’s work in community for the love of justice, and the justice of love.